Interested in publishing? Need advice from someone who’s already been there, done that? Grab your copy of Going Pro today at 20% off the list price! 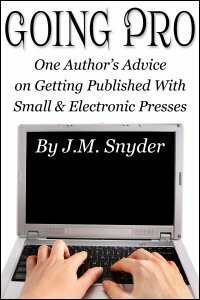 Going Pro: One Author’s Advice on Getting Published with Small and Electronic Presses is a concise guide that offers advice on all aspects of writing for publication. From finding the time to write to finding beta readers, from navigating all the elements of a successful submissions packet to understanding a publishing contract to marketing your newly published book — here I offer the best advice I can on getting your first story from a file on your computer to an e-book released by a small or electronic press.